The Tampa Bay Rays are a relevant part of the playoff race in large part because of their starting rotation. But recently their rotation has been hurt by the injury bug. On Tuesday, the Rays placed starter Alex Cobb on the 10-day DL because of a case of turf toe in his right big toe. Cobb, who’s been one of Tampa’s best starting pitchers this season, doesn’t believe he’ll be out long. However, he becomes the third Rays starter on the injured list. Cobb also pitched on Saturday and showed no signs of being hampered by an injury. He took the tough-luck loss against the Brewers after giving up just one run over six innings. However, the turf toe has been a lingering issue for him. Cobb and the Rays are hopeful that missing a start or two now will have the righty healthy and at his best for the stretch run. “Kind of a lingering toe issue that I felt the last game,” explains Cobb. “Talked to (head athletic trainer) Ron (Porterfield) and (Rays manager Kevin) Cash and all those guys about it afterward, and monitored it. Saw that the next day it was still there a little bit and decided just to be smart with it. With the new 10-day (DL), it’s nice (to miss) only miss a start. On the season, Cobb is 9-8 with a 3.80 ERA. Only Jacob Faria and the injured Matt Andriese have lower ERAs among Tampa’s starting pitchers. There’s been little if any drop-off in Cobb’s performance in recent weeks. However, a lingering injury could cause Cobb to alter his mechanics, and that’s not something the Rays want to risk based on how well he’s performed this season. Even if Cobb’s stay on the DL is brief, he becomes Tampa’s third starter on the DL, challenging the depth in their rotation. For now, Cobb will be replaced in the rotation by Blake Snell. After a great rookie campaign in 2016, Snell has struggled this season, getting sent to the minors on two occasions. In 14 starts for the Rays, he’s 0-6 with a 4.98 ERA. 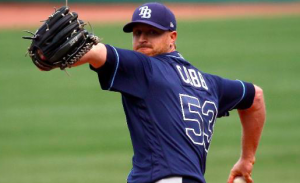 However, he’s had little trouble in triple-A, going 5-0 with a 2.66 ERA, so the Rays are hopeful he can start pitching well at the major league level. The Rays are also trying to get by without Andriese and Jake Odorizzi, both of whom remain on the DL. Odorizzi could be back relatively soon, as he recently began a minor league rehab assignment. Andriese, however, is just beginning to make his return from a hip injury that sent him to the DL in June. Even if both Odorizzi and Cobb are able to return within the next 10 days, the Rays may still need Snell to fill a spot in their rotation, at least until Andriese returns as well. Tampa Bay has fallen 5.5 games out of first place in the AL East. However, the Rays continue to hold onto the second wild-card spot. But in such a crowded race, there’s little margin for error. The Rays have been carried by their rotation all season, but with that starting rotation a little banged up, they will need other parts of their team to step up in the days and weeks ahead in order to solidify a playoff spot.